This year the “Colours” show was a single day format rather than the previous weekend. The three floors of the Dubai stand at Newbury Racecourse (my local racing haunt) were full of traders, demonstration and competition games. It is noticeable that the vague scent of resin at trading shows has now been replaced by the smell of laser cut MDF. MDF was everywhere on sale, which will become appealing when someone begins producing models at smaller than 1:120 scale. The exception is Connoisseur Figurines who are turning out MDF armies in 6mm/1:300. The samples I bought look excellent for my “in period” demonstration battles. Taken at Colours show, Newbury. 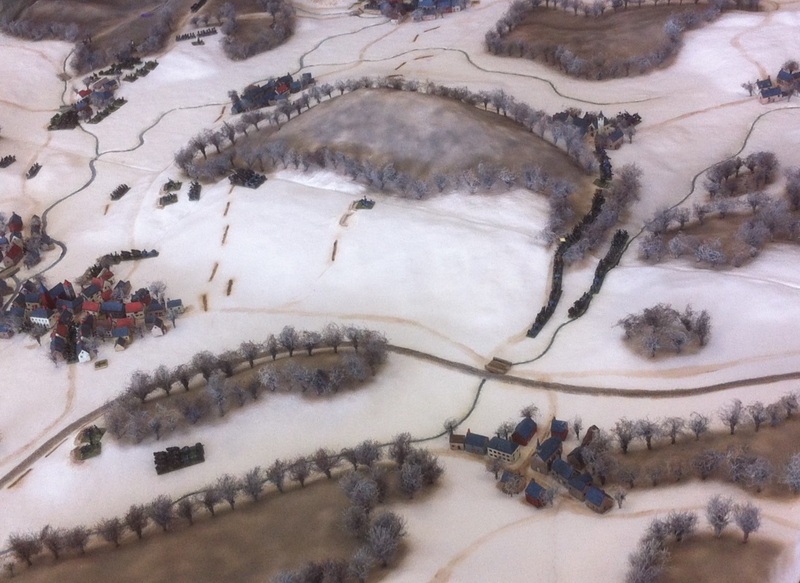 There was also an alternative Gettysburg game where it appeared that the French, British, Prussians, Belgians and Mexicans had got involved in the war. So apart from feeling totally inadequate from staring at other folks’ painting and modelling skills, what did I buy? Napoleonic naval starter game at reduced price from Magister Militum. In both cases, I used my “not sure” rationale. Walk once more around the show and if it’s still there, I was meant to have it. In both cases, it was gone when I returned. I considered a game of “Axis and Allies 1940”. I was bemused by the box art including what looked like Robert Mitchum dressed as George Patton for a 1940 European scenario! I decided the price was too high for the likely amount of play it would get. Kallistra hexagon tiles to top up my stock. Two packs of Milliput modelling material. Baccus 6mm French artillery and the new “animated French”, which I intend to use as Neapolitans that have suddenly become necessary for my Peninsular War campaign. (Racial stereotyping is purely intentional). 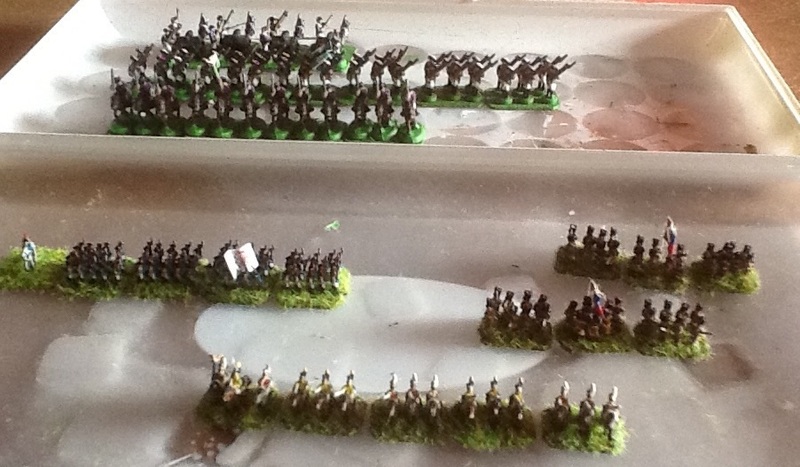 Heroics & Ros French and Spanish 6mm infantry for the same campaign. Osprey uniform books on Napoleon’s Italians and the Portuguese army. Two sets of Warbases MDF tokens engraved with playing card symbols for no actual purpose yet. Several Warbases 7mm dice brackets for use as game markers. I have also commissioned some bespoke numbered marker disks from them. And the impulse purchase. Sam Mustafa’s Blücher rule book together with the 100 days card set. I have read good things about this ruleset on the web. When I got home I learned that a set of cards for the Peninsular War is imminent, so that will be on order as soon as possible. And so home to base up the figures that I seem to have been painting for several weeks. That 6mm snow board is amazing. I like how they did the stands of trees with room in the middle for placement. Genius!